When you register on Moovly for the first time, you get an unlimited Free Trial. During this period, you can test and taste almost all features of Moovly. When you would like to take advantage of premium features such as downloading, sharing your Projects and much more, you should upgrade your subscription. You can change your subscription from the Pro Monthly plan to the yearly plan by going to the upgrade page again and following the steps. We regularly provide discount coupons for upgrades to yearly subscriptions, so keep an eye on our promotions! The Free Education plan is available for teachers and students with an email address from an educational domain. This happens automatically upon registration for known education domains. If your educational email address is not recognized as such, you can apply for a Free Education plan. 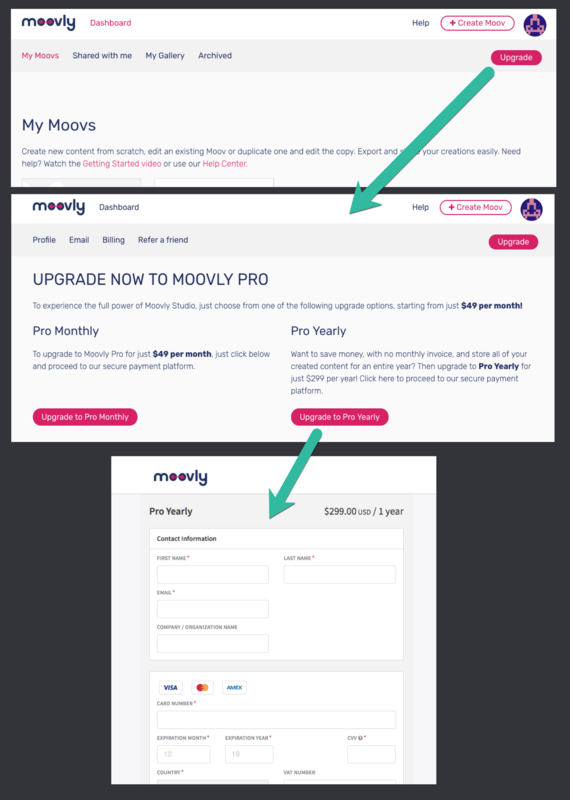 Companies or organizations that have more than 5 Moovly users can take an Enterprise subscription, including additional features and benefits such as a custom group library, custom fonts, increased storage space, floating licenses etc. For Enterprise orders (as of 5 accounts or more), request a quote for your organization using the Business Contact Form.